Written by Janet Choi on November 24, 2015 . If you turn your Econ 101 textbook to the first page, you’ll find a definition of homo economicus: the economic man. It’s an old-school way to understand why people make the choices they do. This character is rational, self-interested, and thinks purely in terms of maximizing his utility. Nothing will persuade him except his own economic gain. And as any marketer knows, that’s a totally unrealistic model. Sure, we all value utility and economic gain, but we also chase rainbows, windmills, waterfalls, and that last cookie in the jar. Assuming that we’re 100% rational and self-interested is a myopic view of what actually motivates people. If your email marketing campaign is governed by this principle, you’re operating from an expired field guide. You need to bring more to the table than a good product or a good deal. You need to persuade people to come and stay at your table in the first place. What follows is our collection of 5 motivational principles to help make you a powerful communicator, no matter what message you’re trying to get across. We’ll dive into why these principles are effective and explore lots of ways you can apply them in your emails. The “Tupperware party” entered the American vernacular in the 1950s. The idea was simple: instead of hiring strangers to sell kitchen goods, the company offered incentives encouraging housewives to become retailers. Women invited their friends and neighbors into their living rooms to drink tea, eat cake, and talk Tupperware. Sales skyrocketed. In 1990, researchers at the University of Chicago studied this technique and discovered what the Tupperware Corporation had put into practice so many decades ago: we’re hugely influenced by other people — especially people we know and trust. In fact, liking the hostess of the party influenced women’s decision to buy twice as much as their opinion of Tupperware’s product. This principle, of course, extends far beyond Tupperware. When we’re uncertain of what to do—whether it’s how to spend our money or how to act — we look to our friends’ and neighbors’ example. Their actions greatly affect our own, whether we assist a choking victim in a restaurant, whether we pay our taxes in full, whether teens shoplift, and whether we recycle. Making a decision can take a great deal of cognitive effort, so our brains are constantly looking for shortcuts. Social proof, or social validation, is your brain’s tried-and-true shortcut, one that’s increasingly handy now that the internet seems to offer infinite choice. 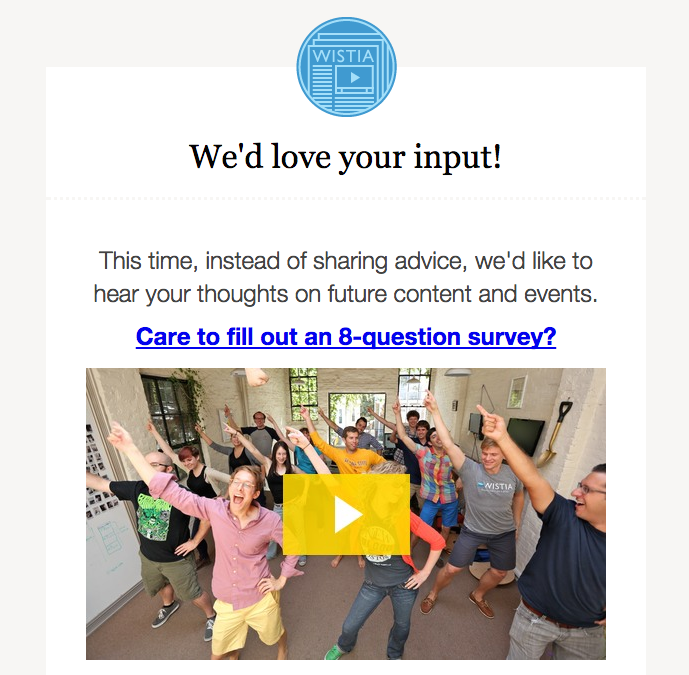 Many companies successfully leverage social validation in their emails. 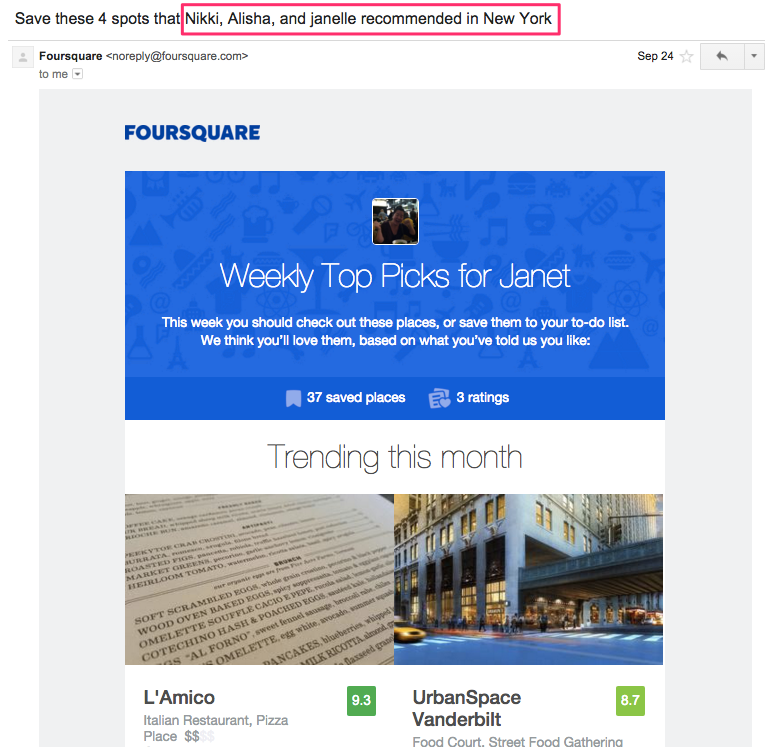 This email from Foursquare brings customers back into their app by telling them what their friends have been up to. The subject line is “Save these 4 spots that Nikki, Alisha, and janelle recommended in New York.” We’re all on a first-name basis here. And the social validation doesn’t stop there. The email has two sections: one listing restaurants that are trending this month generally, and one for places recommended by people you follow. Dividing the information this way provides a lot of value to customers. It lets them see what’s popular globally and what’s trending within their friend group, giving you two lenses to see what’s cool. What’s more, every review in the email is accompanied by someone’s name and picture, letting you know that these are real people, not computers. That small bit of social validation introduces a human element into restaurant ratings and reviews, and makes this email something worth clicking on. Friends are powerful influencers because we trust them. Likewise, authority figures (whether it’s a celebrity, a politician, or a powerful organization) are strong influencers, because we’re more likely to trust them. Amazon might already sound like an authority. But even the behemoth online retailer needed to call in the entertainment industry’s big guns when marketing its latest foray: TV production. When Amazon first started making original series, people raised their eyebrows. Sure, they can sell stuff, but what makes them a credible creative force and television studio? Amazon had a lot to prove, even to their loyal customers. 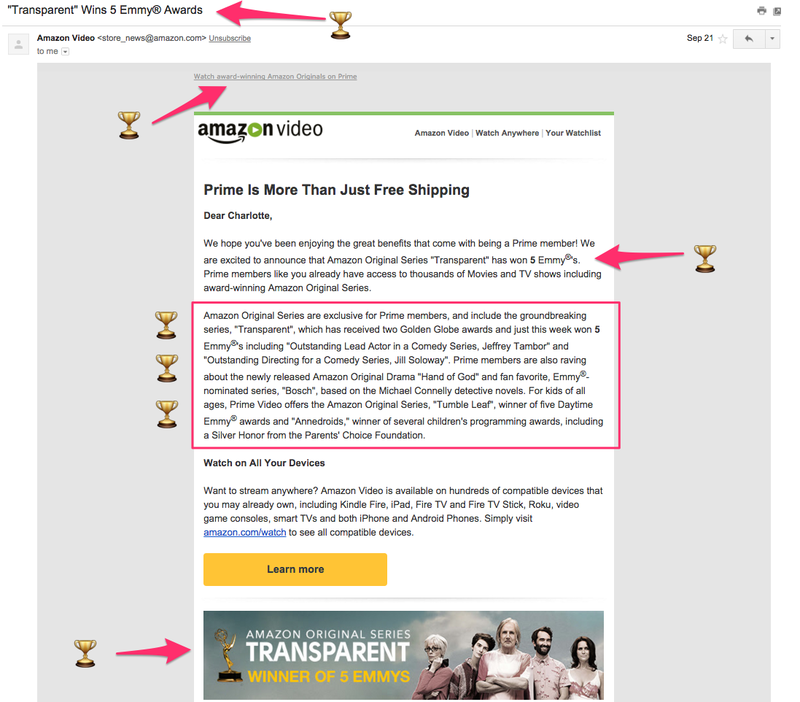 In this email, Amazon uses the authority of the Emmys to give credit to their TV studio’s show Transparent. The subject line doesn’t explicitly sell readers anything, it’s just an announcement: “‘Transparent’ Wins 5 Emmy® Awards.” The implication is that if the Television Academy likes the show, you should too — and that’s the tack Amazon ends up taking in the body (and preheader) of the email. Aristotle’s point that “What is rare is a greater good than what is plentiful” is something philosophers and psychologists agree upon. When a resource is scarce, we value it more — whether that resource is precious metal or even cookies. In one study, researchers examined how much people valued a crowd-pleasing dessert: chocolate chip cookies. When participants saw a jar of 10 cookies swapped out for a jar with 2 cookies, they rated them as more desirable to eat, more attractive, and would pay a higher sticker price at the supermarket … despite the fact that they were all from identical Nabisco packages. Note how the only difference was the consumer’s perception of how many cookies were available. This makes it an easy tool to integrate into your email marketing campaigns, as even hinting that something is scarce can be enough to motivate. Let’s say your products really are scarce — you only have a 100 gourmet snack boxes in stock, or there’s a limited amount of tickets you can sell to a concert before violating fire codes. Use your emails to remind customers of this scarcity! The internet makes it seem like there’s an abundance of everything and an infinity of options. Often, this blinding amount of choice inhibits customers’ resolution to buy. Rather than settle for something they just think they’ll like, they want to make sure they’re getting the best possible deal or the best quality product. So what’s a marketer to do? Motivate customers to buy now because of the limited supply. This email from Student Universe does exactly that. 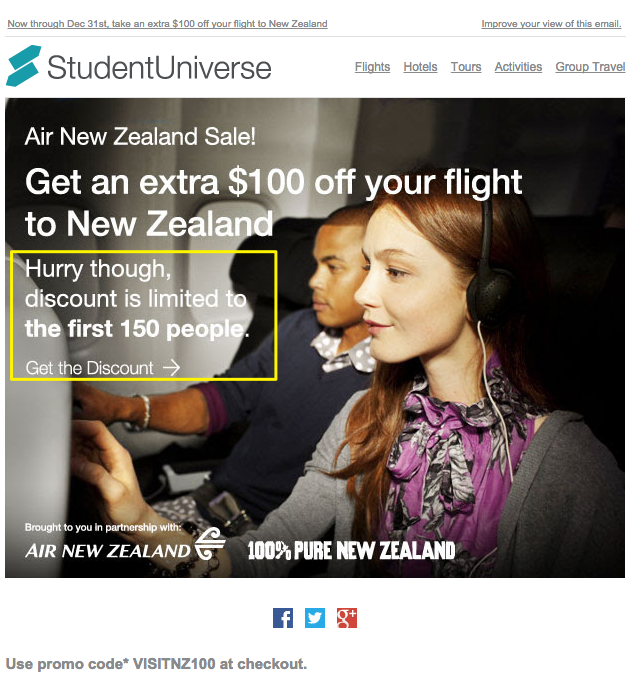 It advertises a discount of $100 on flights to New Zealand, but only to the first 150 people to take the deal. It’s not a huge price slash, given that flights are upwards of $1,000 from the United States. But by indicating that the deal is scarce can get people to commit to purchasing sooner. Maybe they could find an even better deal if they kept looking, but a 10% discount looks pretty good when it’s scarce. It’s also possible to create artificial scarcity — making something seem scarce when it’s actually not. It’s the reason Starbuck’s pumpkin spice latte is such a hit. The company created buzz around an allegedly seasonal drink that in reality isn’t even seasonal. The pumpkin spice latte could be available year-round, but Starbucks knows that creating artificial scarcity will stir more excitement about the product. 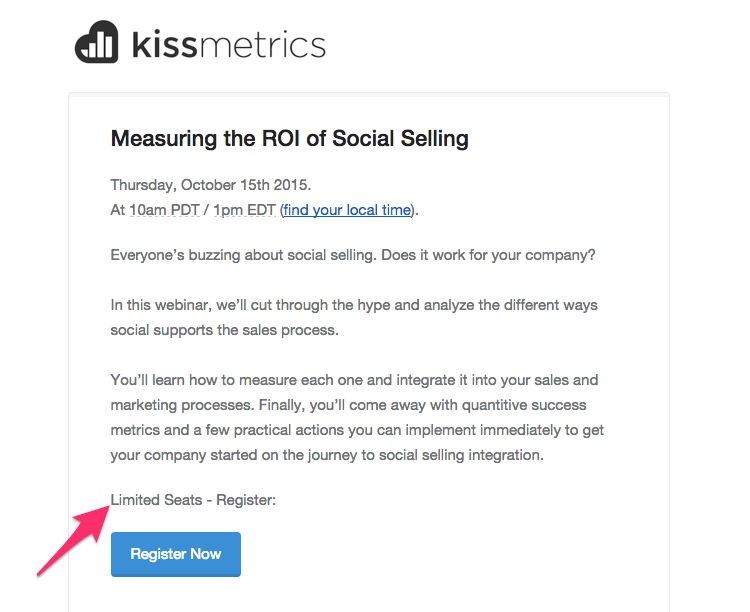 This email from KISSmetrics uses the same technique as Starbucks. They’re offering customers “seats” to a webinar, a scalable product that could theoretically go out to an unlimited number of people without costing them much. What’s more, the webinar is available as an online video on their website after it airs, which means people can access it any time they want. If you take a closer look, the product isn’t scarce at all. But this email doesn’t mention any of that. Instead, it stresses that the product is limited. They use the language of a traditional venue — “seats” — making readers feel as though it’s a traditional, unscalable event, and the clear call-to-action tells customers they need to register now. Even though scarcity isn’t really there, the copy motivates people not just to act but also hurry if they want tickets. Humans consider gains and losses psychologically rather than logically. A decision maker will select the option with the highest subjective value, whether or not that option provides the highest objective gain. We process differently when something is framed in terms of loss. Though the neurobiological mechanism isn’t understood, fMRIs of tests examining the “framing effect” reveal stimulation in the amygdala, the part of the brain associated with fear, emotion, and motivation. Stimulating the amygdala by triggering our fear of loss is an incredibly persuasive technique. Swarm is an app that lets people share their locations with friends. 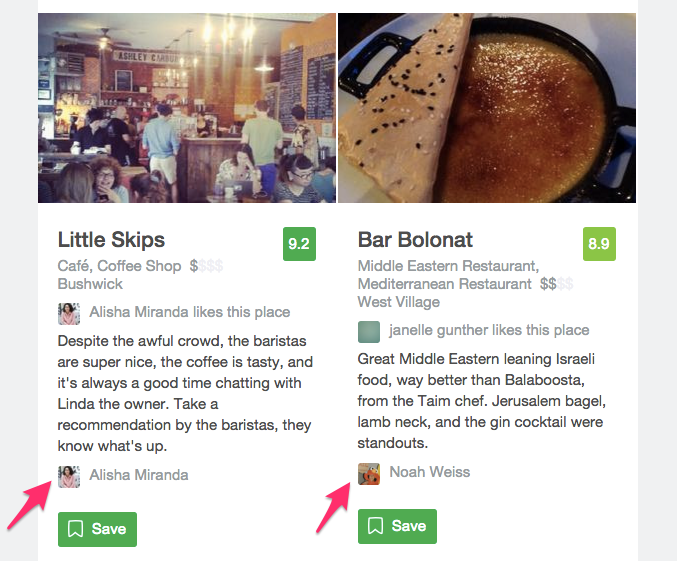 It gamifies checking in, so that users gain points for places they go and things they do. 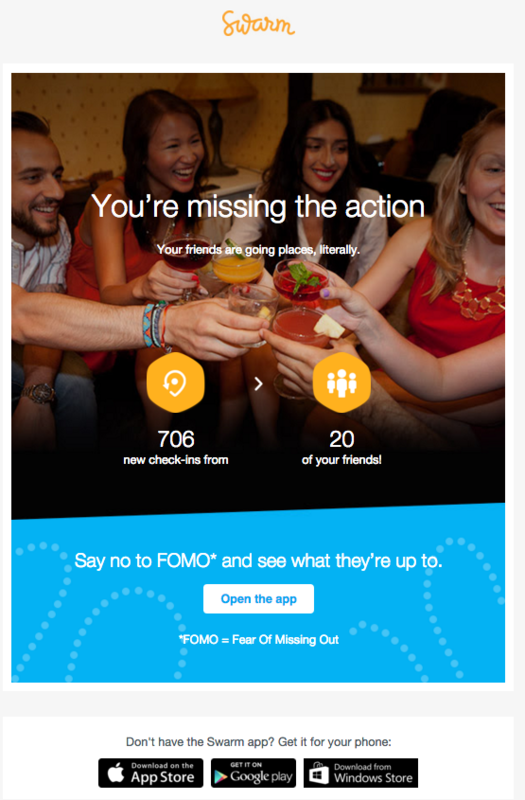 Instead of focusing on all the winning users can do within their app, this email focuses on what you’re losing with the subject line: “You’re missing your friends’ check-ins.” This email instigates FOMO (fear of missing out, which it even defines in the email) by showing what you’re missing by not using their app. Rather than inviting you to join in on the fun, Swarm applies the FOMO lens to play on that common fear that most people have experienced at one time or another: “Is everyone hanging out without me?” What’s more, the email gives concrete numbers of just how many people are using the app. 706 new check-ins from 20 of your friends! Look at all those smiling faces in the photo — you’re not one of them! Swarm understands that we consider losses psychologically rather than logically — and this tactic makes particular sense for the company, given their app’s value fundamentally relies on the power of social networks. Abandoned shopping carts emails are another example of this powerful principle of the fear of loss. According to Salescycle, open rates for such emails are “well above 50% and more importantly, conversion rates around 30% across the board (that’s over 3x the rate of traditional marketing emails! ).” Dot & Bo’s cart abandonment campaigns resulted in a whopping 400% increase in revenue. They send one email 2 hours afterward abandonment, and then if you still haven’t completed the purchase, a second email, a day later, sometimes with extra incentives like free shipping. The emails assume you feel some ownership already. 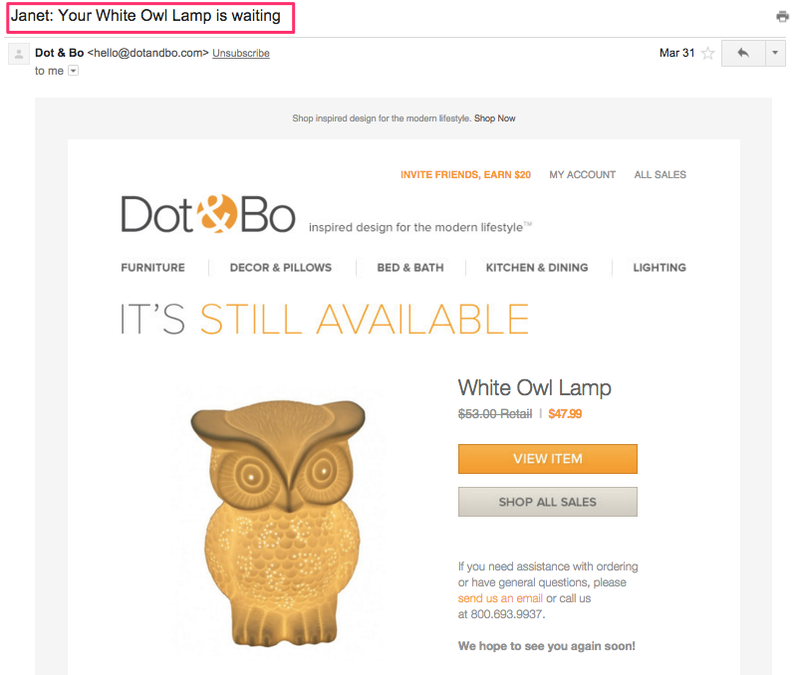 Here’s one that says that this white owl lamp is practically mine and it’s just waiting for me. If I don’t take action, I’ll lose it. When we make commitments to do something (rather than having them imposed upon us), we’re more likely to carry them out. Your copy, therefore, can be more persuasive if you emphasize that there’s a choice in the matter. Restaurant owners across the nation are plagued by a common problem: no-shows. By holding seats for customers who never turn up, they lose a great deal of revenue. Efforts attempting to staunch the loss, like demanding a credit card to put on file as a precaution, leave customers angry and even offended. But Gordon Sinclair, proprietor of Gordon’s restaurant in Chicago found a way to change his no-show rate from 30% to 10% without snubbing anyone. He instructed his receptionists to stop suggesting, “Please call us if you change your plans.” Instead they were to ask, “Will you call us if you change your plans?” — and then wait for a response. By asking for an answer — a firm, specific “yes” or “no” from the customer, the person making the reservation made a commitment. Researchers who looked at Sinclair’s policy shift concluded that by getting a committed response, customers felt a greater stake in the outcome. 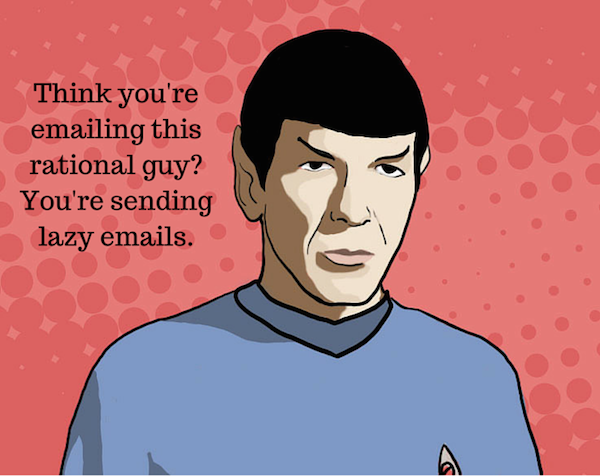 How do you apply this psychological principle to your email marketing? One way is to emphasize a customer’s agency. Remind the customer of the commitment they previously made, no matter how small it was. For example, in upsell or cross-sell emails, a simple “thank you for choosing us” is a simple prompt of the commitment they’d made in the past. 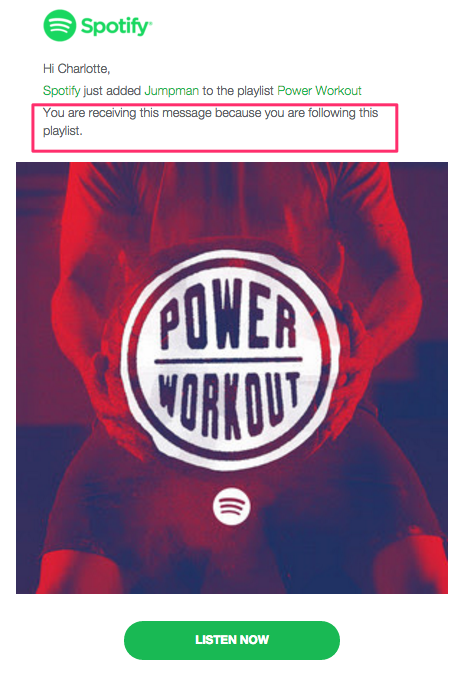 This email from Spotify reminds users why they’re receiving this update: “You are receiving this message because you are following this playlist.” Because users elected to receive this email, they’re more likely to follow through on their commitment to engage. In Spotify’s case, users might be more likely to actually click through on the email and listen to the new song, instead of ignoring it or even reporting the message as spam and impacting your deliverability. It’s why this type of explainer blurb is an email marketing best practice. Reminding users that this email isn’t spam but something they explicitly opted into helps them feel in control and build a sense of trust with you. Reciprocity is a norm that exists across cultures and borders. What’s particularly interesting to marketers is that the rule of reciprocity stipulates that any unexpected gift — no matter how small — still registers with us. It’s why smiling waitresses get up to twice as many tips. One informative study looked at the payoff of a small gift in the form of a can of Coke. A vendor named Joe asked people to purchase raffle tickets. He gave some of them a soda, just as a favor. When Joe offered people a Coke, they bought twice as many raffle tickets. By creating a small sense of indebtedness, his gift paid dividends of 500%. Email marketers are perfectly poised to harness the reciprocity principle. We ask a lot from customers. We ask for their attention, for their business, for their “likes” on Facebook. But there’s one thing we ask for that’s notoriously hard to get: the customer survey response. Surveys provide the feedback necessary to give customers a better product or user experience. And they only take a minute. It’s a win-win, right? So why do so many of them go unanswered? Because the email requesting survey responses don’t motivate people. The video hosting platform Wistia turned the tables by giving a little gift along with their request. Their gift, fittingly, was a video — a video of the whole team doing the Hustle. It was goofy and fun to produce, sure, but it also got responses. 2,400 people played the video, and they got about 78% engagement. Pretty good stuff. What’s more: over 1,000 people filled out the survey. That’s almost 50% of the people that watched the video. It was enough to get their foot in the door. And it really worked. Giving customers something to smile about was enough to motivate them to fill out the survey.